View More In Table Lamps. *Lifeholder Energy-Saving table Lamps comes with environmental vision, low power consumption light source, fit for bedroom, living room, dining room, office or study. * Energy-efficient light with compact fabric shade which could definitely creat a warm and cozy feelings is perfect for illuminating / sleeping. 1.Make sure cut off power supply before finish the assembly. 2. Firstly, please unscrew the ring from the bulb base. 3. Secondly, put the lampshade on it. 4. Thirdly, screw on the ring back again to fit the threads to stabilize the shade. Material: Solid wooden base with Linen Fabric shade. The base is smooth and black painted, so it may look like a metal but it's wood for sure. Wattage: 60W Bulb Max. Don't use a bulb exceeding 60W and always choose high quality bulb for a better lighting. 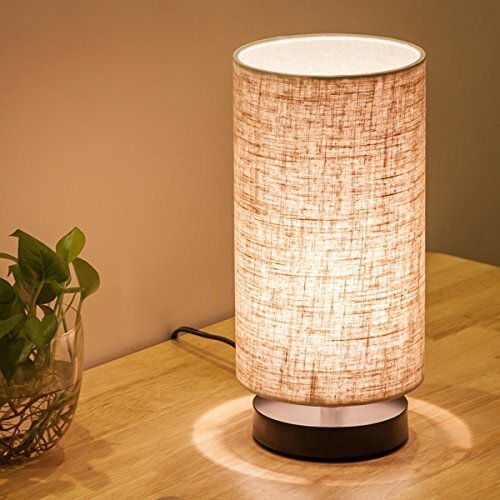 Lamp Size: The Shade is double-layered with 6 inches diameter and 10 inches height. And the whole table lamp is 12.5 inches high with 5 inches diameter antislip pedestal for a perfect looking. Lamp Parameter: Black Base, 110V-130V, 60Wattage Bulb Max; Lamp bulb base: E26(Bulb Not Included), you can choose a warm white or cool white bulb yourself depending on the brightness you want. Simple and Vintage: Smooth wooden texture base with a cylinder linen fabric shade definitely gives much aesthetics to this desk lamp and makes it a perfect addition to your room. 100% Satisfaction Guarantee: Please do not hesitate to contact us if there is any quality issue for this table lamp or you are not happy with your purchase(90 Days Money Back and 2 Years Replacement Warranty). If you have any questions about this product by lifeholder, contact us by completing and submitting the form below. If you are looking for a specif part number, please include it with your message.